Given the accelerating threat landscape, you need a more effective security operation center (SOC) framework. Yet, you’re likely challenged with poor staffing, a lack of automated or integrated toolsets, and unclear metrics. To achieve a better SOC design, a NextGen SIEM with embedded security orchestration, automation, and response (SOAR) should be the heart of your solution to expedite workflows and ease threat qualification and remediation for your team. 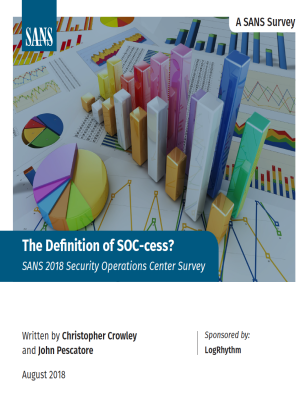 The 2018 SANS SOC Survey offers insight into why NextGen SIEMs are a core technology for SOCs that unify intelligence and data. Read the full report to discover SOC best practices that improve performance. Download the survey to learn the state of today’s SOCs and best practices for security operations teams.